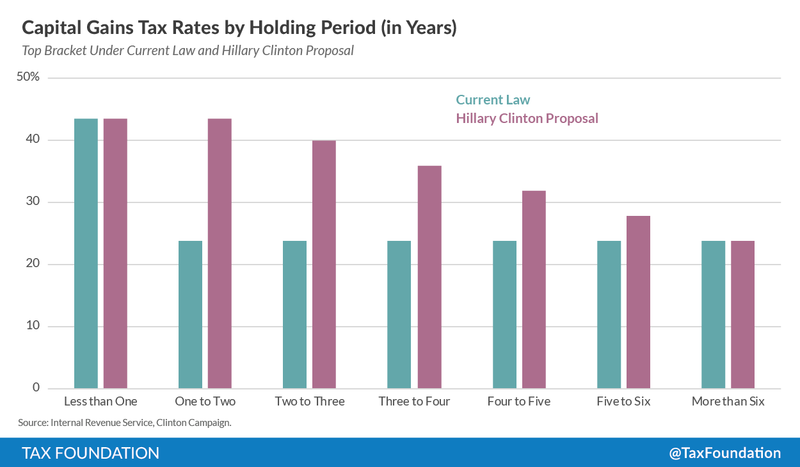 One of the least effective features of Hillary Clinton’s tax plan is its sliding scale for the capital gains tax rate in the top bracket. Instead of having a single rate, taxpayers in the top bracket would now have six different rates based on the holding period for investments. Why create such an ugly-looking system with so many rates? Well, the idea is that CEOs are beholden to “activist investors” with an unreasonable short-term focus, and therefore, they’re unwilling to make long-term plans. This proposal, by mucking around with the incentives for some investors and pushing them to hold their capital longer, is supposed to change investor’s opinions and make them more long-term focused, and thus, make the CEOs more long-term focused as well. If this sounds like a Rube-Goldberg contraption to you, you’re not alone. The complexity of the ostensible transmission mechanism from this tax proposal to actual economic outcomes is good reason for skepticism. But there’s an even simpler reason for skepticism: investors trade short-term cash for delayed earnings all the time. In fact, that’s what investing is. If you really wanted all your money now, and none of it in the future, you wouldn’t be investing in the first place. What this means, for people unfamiliar with investing, is that if you invested $539 in 2015 in Amazon stock, your share of the company would get about $1 of earnings. Obviously, that’s a terrible deal! You’d do way better in the short term with virtually any investment you can think of. And yet, rather than dumping their Amazon stock, investors bought it in droves in 2015; in fact, the share price more than doubled! So why did people like Amazon stock so much? 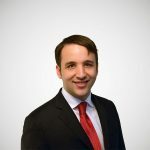 They understood that Amazon was in the process of setting itself up for the long term, expanding revenues (though with low profit margins) on its internet retail, and building a profitable web hosting service that will deliver earnings in the near future. 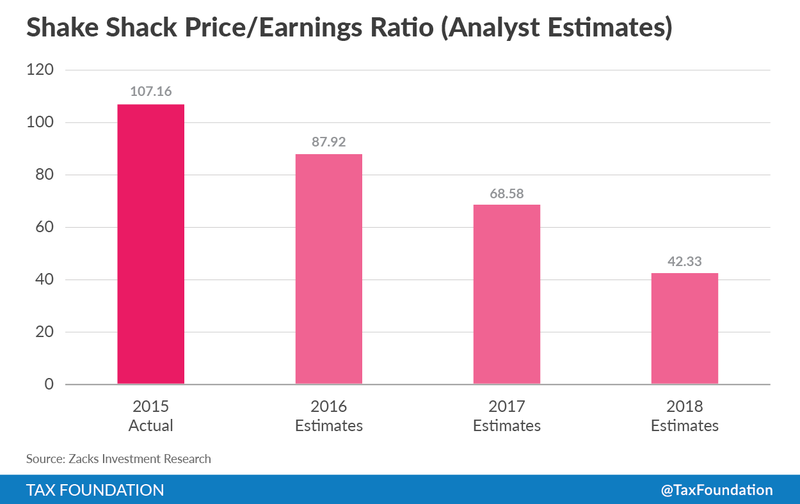 This expectation is reflected in the lower expected P/E ratios in the future; the analysts expect Amazon’s valuation to remain high, but they expect earnings to rise, justifying the valuation as the company matures. Shake Shack isn’t earning too much per share right now, but investors expect that to get better in the future. It’s rapidly expanding, so some of its fixed costs will be defrayed over many restaurants, boosting the bottom line. In both of these cases, you see that the P/E ratio is expected to get better in the future. 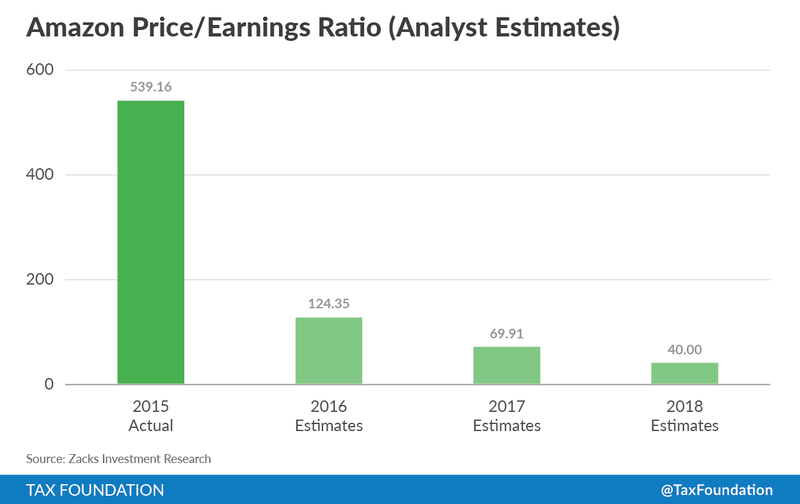 What that means is that the analysts expect these companies to be able to deliver earnings later, even if they aren’t earning enough to justify their prices now. The evidence from firms like these are the precise opposite of what Hillary Clinton seems to believe; investors are long-term people, by definition, and they're happy to fund long-term businesses.